Visible rewards for original-owner of 1971 Mach 1. Robert Macabobby hung his dog tags on the rearview mirror of a dealer demo, 1971 Mustang Mach 1 when he was 21 years old. Decades later, Macabobby and his Grabber Lime Green Mustang attended the Mustang 45th Anniversary Celebration at Barber Motorsports Park in Birmingham, Alabama. 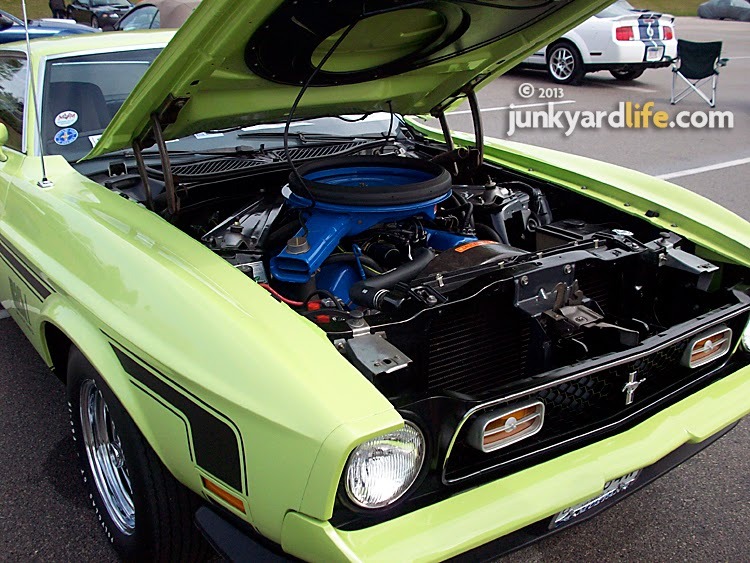 Macabobby, a member of the Mustang army since 1972, hauled the vibrant green 'Stang from his home in Youngstown, Ohio. The one-owner Mustang still wears Macabobby’s Vietnam-era dog tags on the rearview mirror. 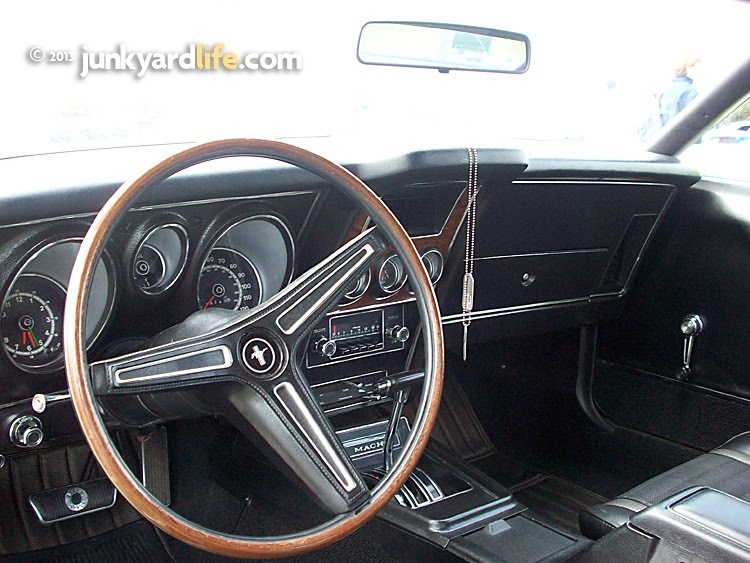 Not much has changed inside Macabobby’s 1971 Mustang Mach 1 since the Vietnam war. I caught Macabobby and his 39,743-mile Mustang in the paddock area of Barber Motorsports Park on an overcast Sunday morning. 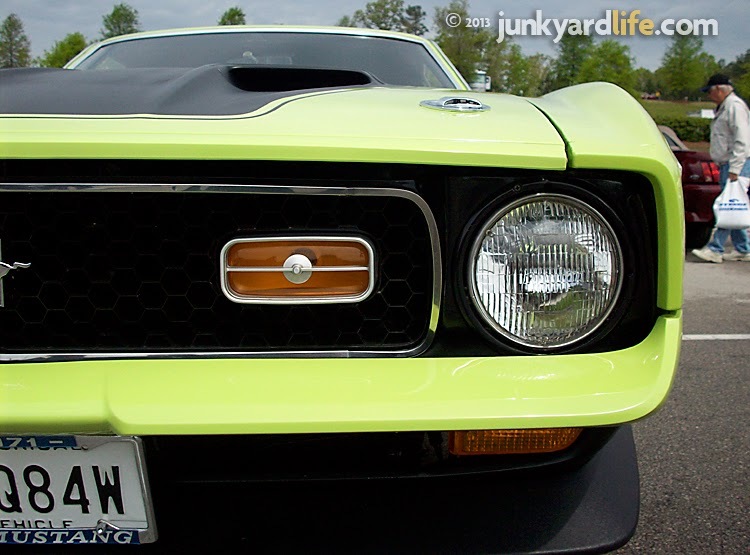 The Mach 1’s eye-searing, bright hue is known as Grabber Lime Green paint. The color was applied to only 663 of the 149,678 Ford Mustangs produced in 1971. 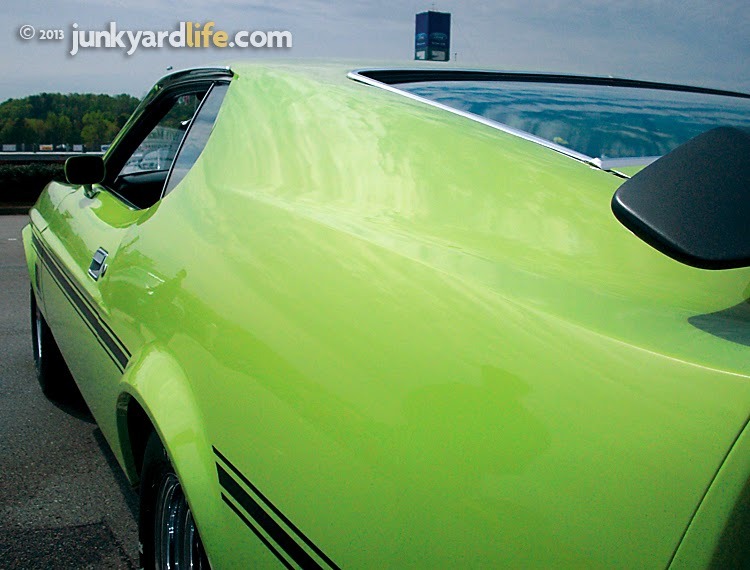 I couldn't help but notice the attention to detail on every piece of the gleaming green Mach 1. Macabobby knows Mustangs because he is a Gold Card National Judge in the Mustang Club of America. Macabobby’s Mach 1 looks better than it did when it was new. He obliged and opened the hood to show off the pristine blue, 285-horsepower, 351 Cleveland engine. The blue engine surrounded by lime green is a visual knockout. Macabobby pointed out the inspection marks under the hood and the Mustang’s host of options, some original, some not. Macabobby bought the dealer demo model Mach 1 with 5,000 miles in January of 1972. The restyled Mustang lacked a few options on his wish list but was a budget buy at $2,995. The Mach 1 originally had a $4,100 window sticker. A Ram-Air air cleaner assembly, four-barrel carburetor and a set of Magnum 500 wheels now complement the FMX automatic transmission, twist hood locks, rim blow horn and Mach 1 decals. Rare Grabber Lime paint is hard to miss on this 1971 Mach 1. Macabobby thought he must be crazy when he started making payments on the $2,995 Mustang in 1972. The $85 per month payment was a lot of money for the time. Walking around his car now, Macabobby proudly notes the benefit of his pony car investment. 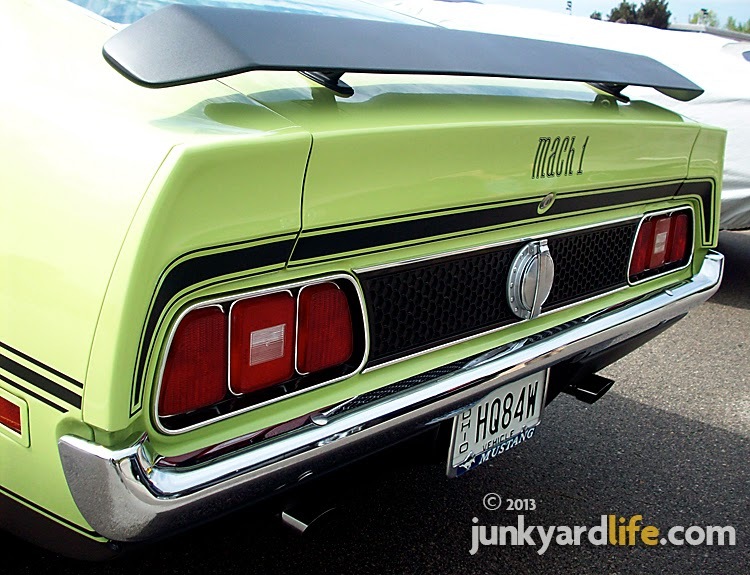 This Mach 1’s original owner beams when he points to the rear spoiler. “If you can find one, they sell for $1,000. 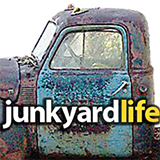 The twin chrome hood locks, a $25 option when new, sell for $300,” said Macabobby. 1971 brought a redesigned and much bigger Mustang Mach 1 into the Ford lineup. Two more Mustangs are in the corral at Macabobby’s home. A 1966 convertible with a 289 cubic inch engine and a 1994 GT with a 5.0 engine. I asked him to compare his Mustangs muscle. “For straight line performance the Mach 1 wins, for all-around road manners, the '94 gets the pick,” Macabobby said. Macabobby is an active member of the Mahoning Valley Mustangs Club in Ohio, a regional group of the Mustang Club of America. Macabobby’s son has plans to pry the Mach 1 away from his collection, but for now, the car will stay in his garage. A 351-Cleveland V8 engine provides the motivation for the Mach 1. 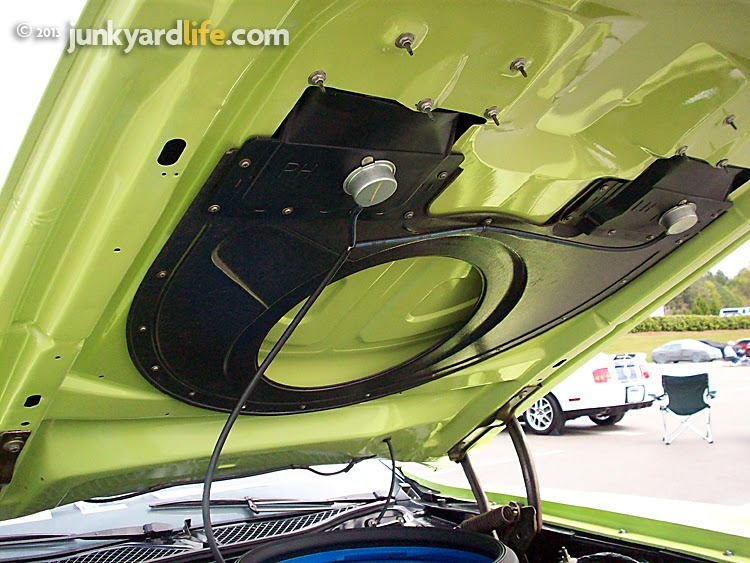 Twist hood locks add a performance look to the already intimidating ram air Mach 1 hood. Twin NACA ducts provide the snort and ram air into the engine via the topside of the air cleaner. 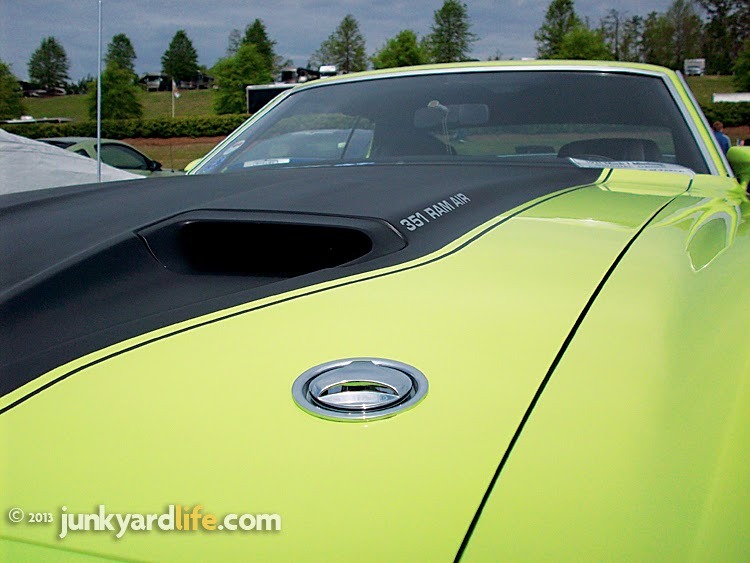 Can you read the Mach 1 hood scoop? Ram Air rules! 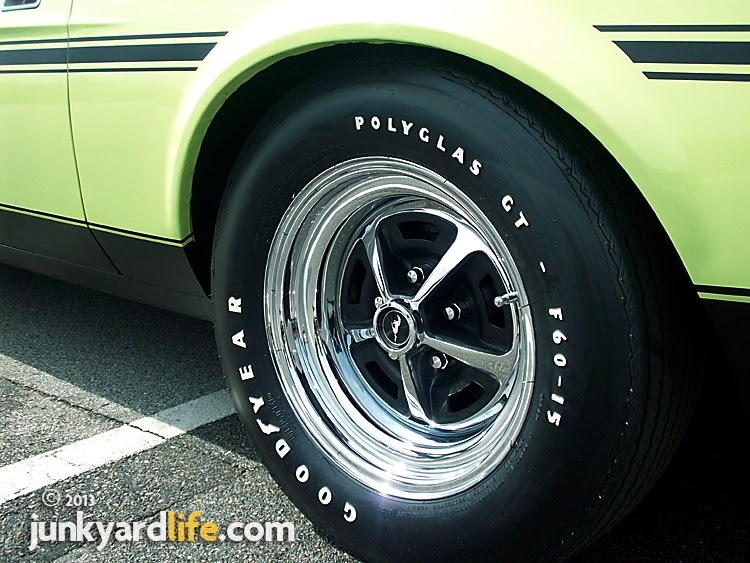 Macabobby added the Magnum 500 wheels to his ’71 Mach 1. Mach 1 stripes accentuate the long, low look of the redesigned-for-’71 fastback. 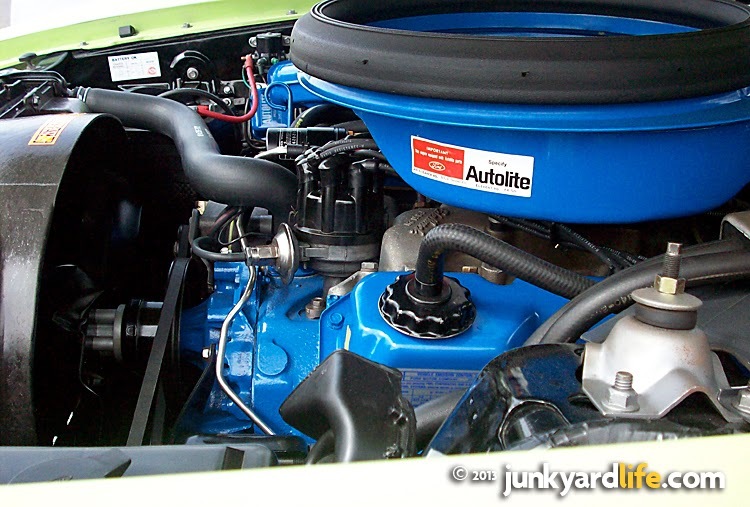 Ram air hood plenum with vacuum solenoid-actuated flappers allow air to enter the air cleaner on Macabobby’s 1971 Mach 1. A 1971 Mustang Mach 1 is only 2.1 inches longer than a 1970 model Mach 1 but from this angle, it looks much longer. 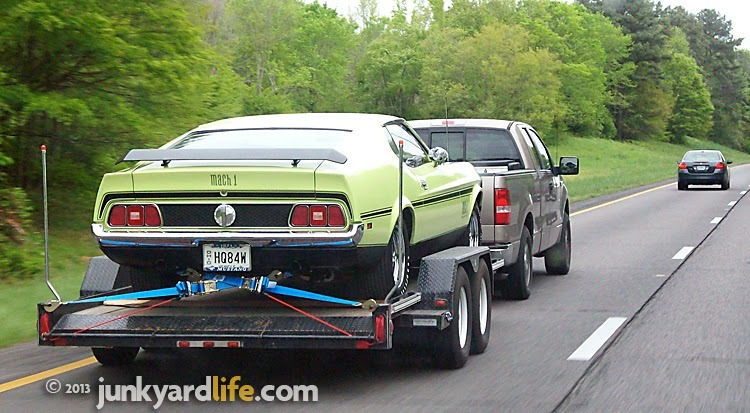 Macabobby loaded his 39,000-mile Mach 1 onto a trailer and headed home.